Is a voluntary licensing scheme for hand car washes based at supermarkets enough? NTU researchers welcomes the Government's response to the Labour Market Enforcement Strategy but call for a broader scheme to tackle the long tail of informalized workplaces. there is a need to further explore and identify the issues within this sector to enable the development of a robust evidence base that will help to determine the most appropriate regulatory approach and enforcement body. Our research challenges the licensing model discussed by the Government focusing on attention on supermarket hand car washes. We already know that the most likely location for a hand car wash to set-up is on an abandoned petrol station forecourt or the forecourt of still open petrol stations. In fact, our research found that 67% of car washes we examined located on these premises. It is for this reason that we do diverge with the view of the government and some regulators that a voluntary licencing scheme on supermarket car parks will be fruitful. It may be in individual cases but the majority of unregulated informalized hand car washes are located beyond supermarkets. We also know that these hand car wash workers are subject to significant levels of wage theft in terms of underpayment of the minimum wage. Lastly, we know that whilst many hand car wash workers are subject to routine labour market exploitation by unscrupulous employers some hand car wash workers are subject to more serious criminality associated with modern slavery and labour trafficking by criminal gangs. We welcome the government’s acceptance of many of the director’s recommendations on the enforcement of holiday pay for all workers and that all workers should receive a statement of all their mandatory employment rights on their first day at work, rights which will come into force in April 2019. 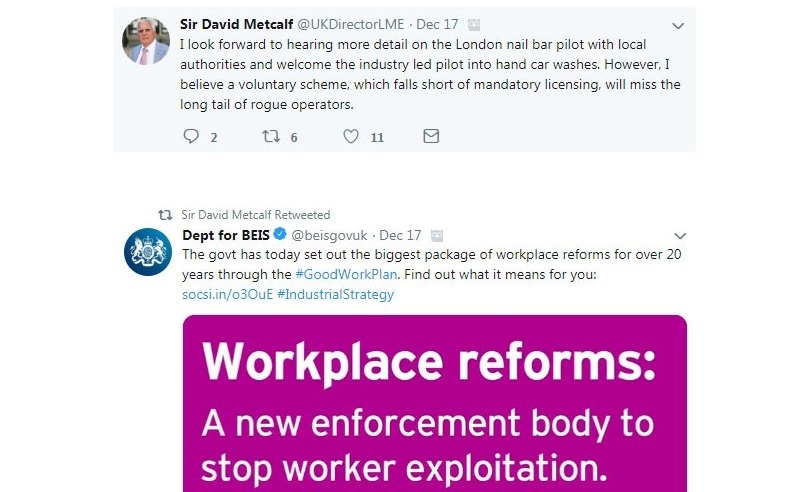 More significantly though the government identify the importance of new enforcement tools in areas of work subject to significant informalization of employment practice such as hand car washes and nail bars. In both sectors of employment vulnerable workers who are often migrants suffer at the hands of unscrupulous employers who see non-compliance with employment rights as part of their business model and accordingly pay workers less than the minimum wage and ask them to work in unsafe working conditions. The government accepts the recommendation that a new enforcement mechanism associated with a licencing scheme is the appropriate way to enforce employment rights and employment standards at hand car washes. 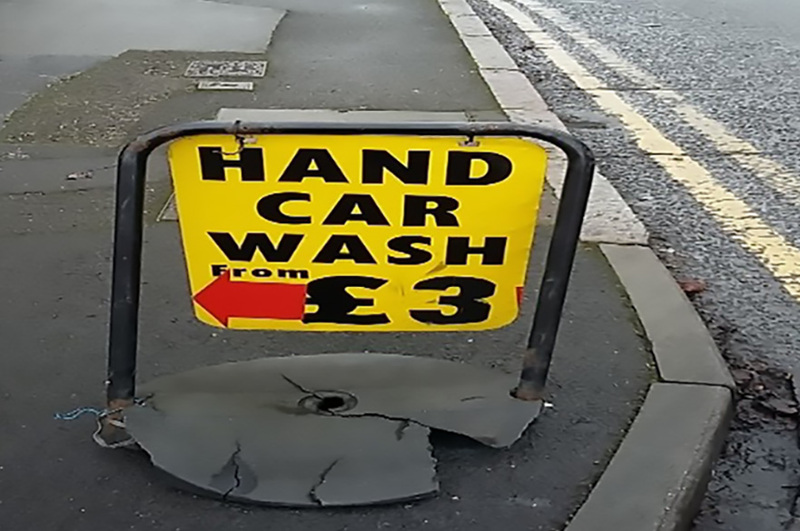 This reflects the thinking of a team of researchers at NTU who advised the director of labour market enforcement on the plausibility of a licencing scheme for hand car washes. Like the team (Ian Clark, Huw Fearnall-Williams, James Hunter and Rich Pickford) the government suggests a geographically limited scheme for example in the East Midlands. The government also suggests, as our team do, that such a pilot scheme will identify other issues in the hand car wash sector such as the propensity of car washes to locate on particular abandoned spaces such as former road-side petrol stations, car dealerships or on car parks of now closed public houses. Indeed the current research being undertaken by the team meets all these recommendations and will lead to the creation of robust spatial evidence base on hand car washes across the whole of the East and West Midlands informed by quantitative analysis. Like the government, the team aim to produce evidence that will help regulators determine the most appropriate regulatory approach and enforcement regime for licencing. This second phase of research (completed by summer 2019) will feed into additional research further formalising the various hand car wash categories and their impact. Our multi-disciplinary approach is also beginning to engage our student population to broaden and deepen this research. The NTU team are the recognized research leaders in this area and have published on this issue in world-leading journals such as British Journal of Industrial Relations. In addition to this, they have provided oral and written evidence to the Director of Labour Market Enforcement and the Environment Audit Committee in Parliament. Our current project will report its findings by the summer of 2019 and will provide many of the answers that the government and the Director of Labour Market Enforcement are currently seeking. We welcome any and all opportunity to discuss our ongoing research and look forward to supporting all parties to tackle the challenges hand car washes and informalized work brings to our society. To find out more about our research read about our research project launch, our written and oral submission to the Environmental Audit Committee or contact us via email.